A few decades back, there were not many solid biblical and theological resources available on the Holy Spirit from a more charismatic or Pentecostal (or continuationist) perspective. But such has drastically changed in the past few decades with a plethora of resources on continuationism now available to Christians. Here is a short but solid list at my co-authored blog, To Be Continued. 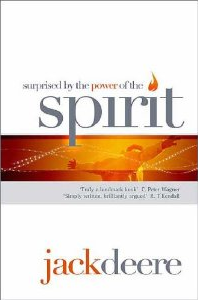 One such continuationist theologian is Jack Deere with his book, Surprised by the Power of the Spirit. He also has authored Surprised by the Voice of God, which I hope to dip into one day in the near future. Deere is an interesting case, and you will see this in the book as he shares his own story. He had been an associate professor of Old Testament at Dallas Theological Seminary (from now on DTS), which has been known for its cessationist position throughout the years. But, as Deere shares his story of moving from cessationism to continuationism, he tells of a phone call that changed his life forever. This phone call set into motion a chain of events that left him convinced that the Holy Spirit and all of His gifts are still available to body of Christ today. In the end, Deere had to leave DTS, as his new found continuationist beliefs did not allow for him to stay within the confession of faith of the seminary. From reading the book, you get the sense that the parting of ways was not nasty, but I’m sure it was not easy for either sides – Deere or DTS. My colleague here at To Be Continued, Marv, can share more insightful thoughts about Jack Deere, as he had Deere as a professor at DTS and was also part of the Vineyard movement of which Jack Deere was also a part of as he worked closely with founder John Wimber for a time. But it seemed the parting of ways with the seminary was done respectfully, and I say that because I did not sense any animosity from Deere in the book, which is a great plus. 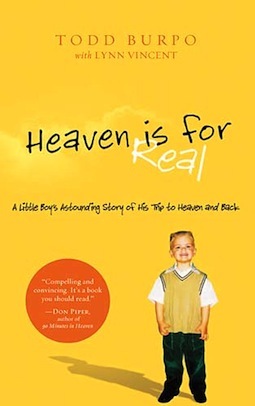 One of the things I liked about the book was that it included storied accounts throughout the book – Deere’s transition to continuationism and practical examples of the charismata of the Spirit in his own life and others. It wasn’t just theology. For me, I don’t need the theology. I am convinced of continuationism. Instead, I like to be encouraged with accounts of God’s power at work through the Spirit amongst the body of Christ. That is what stirs me most. Still, for those who are unsure of the continuation of all spiritual gifts, or who may even be antagonistic to such, the theology in the book is solid, looking to be grounded first and foremost in Scripture. Thus, I think it worth a read for any continuationist or cessationist that is looking to faithfully interact with a continuationist perspective of Scripture. A warning for someone who is more cessationist: I am confident you will find statements that you will not like. What I mean is that, at times, Deere does not butter things up. There are times when he makes very poignant and honest statements. I believe he feels he can make such statements because he was once a cessationist and can address what he sees as ‘holes’ in the cessationist view. I don’t say this in some ad hominem way, as I am aware there are some who have moved from continuationism to cessationism. Still, there are times when he is forthright with some of the cessationist arguments that I believe fall short of faithfulness to the biblical text. For example, chapter 5 is entitled, The Real Reason Christians Do Not Believe in the Miraculous Gifts. He shares a few reasons why people do not believe in the miraculous gifts, but he points out one major reason: because they have not seen miracles in their present experience. That is a major argument for cessationists. And the reverse would probably be true of most continuationists. One reason we believe they still exist is because we believe we have experienced and seen examples of such gifts of the Spirit. Interesting how our experience shapes our theology. We must recognise this. It’s not evil and ungodly. It’s a reality of every Christian (and non-Christian). I share more along these lines in this article and this article. One of the things I didn’t fully agree with Deere about, which isn’t that major, came from chapter 5. He states that a false assumption of cessationism is believing that the apostle’s healing ministry was the same as the gift of healing. First off, he notes there is an assumption amongst some cessationists that the apostle’s could heal automatically, any time they wanted, at will. But that is far from even the biblical record. This could simply be a case of appealing to silence, meaning that something must be true because the opposite is never stated in Scripture (hence, there is silence on the matter). Thus, because the Greek word, charismata, is never used in connection with the use of the miraculous gifts amongst the apostles, then their use of such must have been a different category. Again, I’m not sure this fully holds up. Still, another problem is that non-apostles like Stephen and Philip were used in such miraculous ministries described as ‘signs and wonders’. See Acts 6:8 and 8:4-8. I would not exclude ‘signs and wonders’ from those who were not apostles. And I wouldn’t try and dichotomise the miracles and healings of the ‘normal’ body of Christ from the signs and wonders of the apostles. I don’t think it’s fully sustainable. Not only is the book a theological resource for a case for continuationism, but it is also a very practical help at times. Not just with storied accounts of healings or prophecies or words of knowledge, though those give great encouragement, but also with counsel and wisdom in regards to seeking God and the work of His Spirit, even within churches that are cautious or in cases where one would like to encourage their leadership to be open to these gifts. The final thing I would like to point out is that, in his Appendix B, Deere takes time to address the issue of the existence of apostles today. 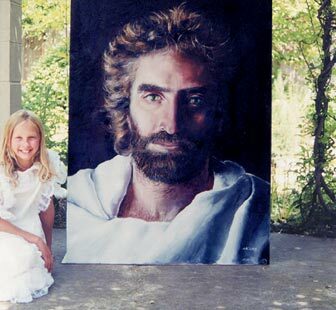 Most who know me will know that I am an advocate for present-day apostles. I have written plenty in a series on this topic, of which I still have 2 or 3 more articles I would like to post. I also have preached on this topic before – you can download the messages by clicking here. This is where the discussion gets down to the nitty-gritty. If apostles exist, are they in the same vein of a Paul, John, Peter, etc? Or are they ‘lesser-than’ apostles? I believe apostles exist today. Would I say they have the same ministry-anointing as Paul? Not really. But I still believe apostles are people of authority, of revelation, who are foundation builders-layers, and who help equip the body of Christ in varying ways, helping us be an apostolic (sent out, mission-minded) people. For those ‘on the fence’ with regards to the continuation of all the gifts of the Spirit for today, these thoughts on apostles today might cause one to immediately reject Jack Deere as a viable source to consider. But such should not be the case. This work is a solid biblical and theological case for contiunuationism, even if one rejects the idea of apostles today. Deere is faithful to not only address the cessationist perspective on particular passages of Scripture and theology, but more importantly he is faithful to present a positive, biblical-theological case for continuationism. Hence, it’s not written as a slap to cessationists. Rather it is a signpost pointing to the ‘charismatic’ work of the Spirit amongst God’s people in this present age. Such was one major purpose of Pentecost. Therefore, I recommend that continuationist, cessationist, and everyone in between look to interact with this book as they think through the validity of the continuing work of the Spirit in all his varying gifts for the body of Christ. As we have stated on our About Page, one thing we would like to provide is theological and biblical resources with regards to a positive case for continuationism. Thus, next week, I shall be posting some thoughts about Jack Deere’s, Surprised by the Power of the Spirit. It stands as a solid work, giving both biblical reasoning for the continuation of all gifts of the Spirit as well as providing real-life stories of situations in which these gifts were used. A couple of weeks ago, I posted an article about a solid theological book on pneumatology, that is, the doctrine of the Holy Spirit. It was entitled, The Holy Spirit and Spiritual Gifts: In the New Testament Church and Today by Max Turner, professor at London School of Theology. The book must be one of the more modern better books on pneumatology. 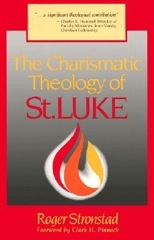 Well, here is another pneumatological title, The Charismatic Theology of St Luke, by Roger Stronstad. Well, I am quite aware of the fact that all things cannot be covered in a 300+ page book, like Turner’s, much less an 83-page book. But I was quite intrigued that Stronstad was able to faithfully look at quite a few things in such a shorter work. He was even pulling in references from various sources, including quite a few intertestamental writings as he looked at some later-BC Judaistic views of the Spirit. Stronstad is a Pentecostal scholar, so I would tend to agree with a lot of things he has put forth in the work. But I would also couple that with stating that he is quite balanced in his approach. Yes, he does believe the baptism, or initial filling of the Spirit, can be received following salvation-initiation. But I do not believe he is one to argue too far over the top, stating that this is the only way. He even ends out in his final chapter with some practical and pastoral challenges such as 1) not seeing tongues as the initial evidence of receiving the Spirit or that 2) we steer clear of a two-tier class of Christianity. Both are not biblically warranted, to which I agree. No wonder Stronstad would later publish the book, The Prophethood of All Believers, of which I also wrote an article about here. 3) Connected to the last point, Stronstad also emphasises that Luke and Paul have different emphases in their pneumatology. Of course, their theology is to be harmonized as part of the whole of Scripture’s teaching. Yet, within Paul’s writings, we continually read of the soteriological necessity of the Spirit, which sees the work of the Spirit as bringing people into sonship with God and incorporating them into the body of Christ. But, in Luke, the Spirit is recognised as the Spirit of prophecy that empowers God’s people for mission and service. And we see this as we compare the use of certain phrases in both Luke and Paul. Interestingly enough, Luke uses the phrase, ‘baptised in the Spirit’, 3 times while Paul only uses it once. Even more, Luke uses the phrase, ‘filled with the Spirit’, 9 times of which Paul only refers to it once as well. Maybe Luke will help inform our pneumatology a little more than we had first thought. Therefore, with anyone wanting to studying biblical pneumatology, especially a Lukan pneumatology, though this book is short and from a more Pentecostal-charismatic perspective, I do think it is worth diving into. For me, I definitely appreciated the work. But may be I am a little biased as a charismatic.